Realtime Spy is a very powerful piece of remote installable monitoring software that can be intentionally abused by the wrong people, or accidentally misused by unknowing users. Therefore, a certain level of responsibility is put upon the user. We feel it is necessary to list Realtime Spy's legal requirements for you to understand. You must agree with each of these requirements to use Realtime Spy. 1. 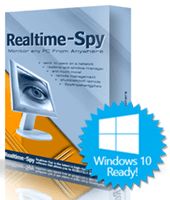 Before choosing Realtime Spy you must first acknowledge and agree to the fact that you are the owner of the remote PC you wish to install the software on. It is a federal and state offense to install monitoring/surveillance software on a PC of which you do not own. 2. If you are NOT the owner of the computer you want to monitor you must have the expressed consent of the owner of that computer to install remote installable Realtime Spy on it. 3. If you install remote installable Realtime Spy onto a computer you do not own, or do not have permission to install it on, we will cooperate with federal, state, and local officials to the fullest extent possible to ensure you are properly punished. This includes turning over customer information, account data, and any other purchase/product related information. 4. By purchasing Realtime Spy remote installable software, you are agreeing to all the conditions in our EULA (End-User License Agreement) found here. This includes the fact that we are not liable for any damage, litigation, or legal predicaments that may arise due to a user abusing Realtime Spy, or any of our products. 5. If the remote user does not download the Realtime Spy remote installation module and run it, then the software will not work - you will have to physically install the software. We are not responsible for getting the user to execute the logging module that you send them, nor will refunds be granted if they refuse to run it - as you can still physically install the software.